It’s that time of year again, when the spotlight falls on the wetlands of Kuala Selangor and its resident and migratory birds. Come 20 – 21 October 2018, Pesta Sayap (Festival of Wings) will host a range of activities at Kuala Selangor Nature Park (KSNP) highlighting the conservation of wetlands and its inhabitants. 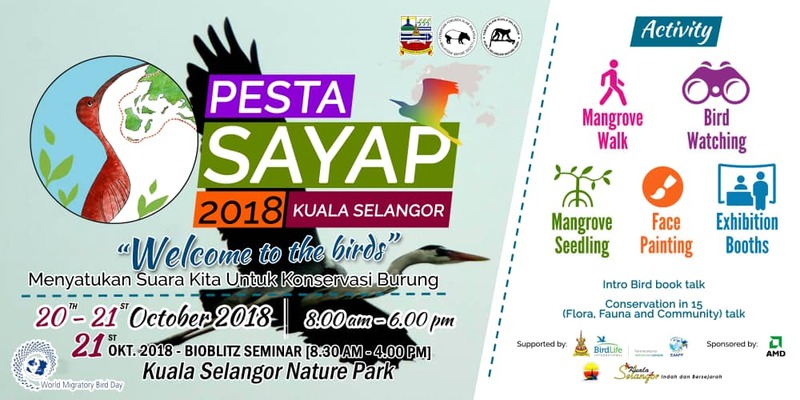 Pesta Sayap 2018 is themed “Welcoming the birds” – Unifying our voices for bird conservation”. The public, MNS Members, birdwatchers and wetlands warriors are more than welcome to attend the day-long public event on Saturday. Engagements include nature walks to explore KSNP’s flora and fauna, birdwatching trips at nearby hot spots, sharing sessions and mangrove seed planting, while children will be entertained with fun and educational pursuits. To raise awareness on migratory birds and their wetlands habitats. To monitor and collect data on resident and migratory birds in the forest and wetlands habitat. Outreach to community and the public, especially youths, on being effective environmental stewards. To promote KSNP and its surroundings as a potential Ramsar site and Flyway Network Site important for local community livelihood as well as an ecotourism destination. Started in 2004, this mainstay in the Malaysian Nature Society (MNS) calendar is smack in the middle of the migratory season, celebrating the millions of birds that use the East Asian-Australasian Flyway to get the best of the seasons. Pesta Sayap also highlights KSNP as an Important Bird and Biodiversity Area (IBA) and potential Ramsar site, and the variety of resident birds that rely on these wetlands to thrive. These migratory birds are not merely visitors to our shores, but an indicator of the health of our environment and ecosystem. The annual Asian Waterbird Census, which MNS undertakes as part of the larger census around the world, lets us see how our coasts and wetlands are doing. MNS believes it is essential to communicate the importance of protecting wetlands, as they are not just for birds. They are the productive fishery areas, the cockle beds, the firefly habitats, the paddy fields – and healthy wetlands provide a sustainable livelihood for the people. Festival of Wings is an open public event. All exhibition booths will be set up on 20th October 2018 from 8.30 am to 5.00 pm. You may register upon arrival and explore the booths and activities offered. For the guided mangrove walk, you may register yourselves at the Nature Guide Booth, where one of our experienced guide will take you for a guided nature walk into the trails at Kuala Selangor Nature Park. The KSNP for Ramsar Seminar organised by the Malaysian Nature Society will run on the 21st of October 2018. The seminar aims to present the latest data on the results of scientists and volunteers research on biodiversity in Taman Alam Kuala Selangor (KSNP). The presentation of the seminar will then be used as a supporting document for the preparation of Taman Alam Kuala Selangor as the new Ramsar Site in Malaysia. This seminar is a limited capacity event. Those who are interested to join can register via email to waipaik@mns.org.my. Click here to download the event tentative.